Devitt Insurance Services Limited is an insurance broker based in Romford, England that has been arranging insurance in the UK since 1936. Devitt offers competitive prices on motorbike insurance, car insurance, van insurance, home insurance and business insurance including specialist insurance policies for dealers and training schools. Reliability, transparency, value and good service all lie at the heart of Devitt’s values. To meet the needs of its customers, Devitt’s online vision is focused on user experience and making processes simple and clear. And with the increasing amount of customers who are purchasing online rather than phone, Devitt saw the need to further improve these online processes for an even smoother customer journey. Devitt’s customer journey is an interesting one. While some visitors enter their website directly, there are many that enter via comparison sites, in which case they’re already halfway through the journey (having already filled in their quote details). We aim to make the transition for visitors from these comparison sites to our own website as simple as possible, ensuring that all trust signals are visible and important information is readily available. Lots of variables are involved when it comes to requesting a quote for insurance. In order to receive an accurate quote, online insurance forms, therefore, have a large number of fields that need to be filled in by the customer. Consequently, identifying areas where customers might be experiencing difficulties or dropping out of the journey is vital. 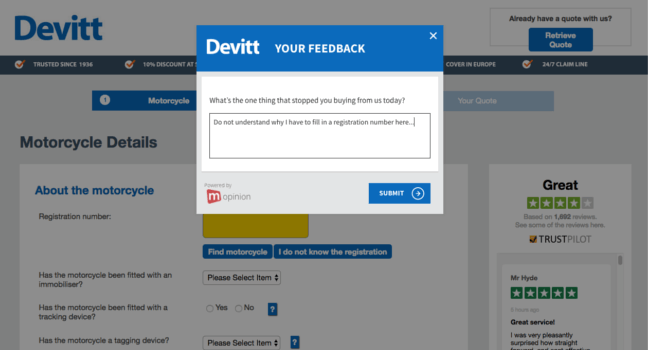 Prior to its partnership with Mopinion, Devitt was already looking for ways to improve their user experience and assist with policy conversions. There was a need to identify the barriers to quote completion and establish the points of friction within the journey. Potential customers were visiting the website, but not converting. Mopinion has helped us to improve our online conversion rate with an ‘aggregation of marginal gains’ throughout the user experience. In other words, we were making small tweaks in different parts of the journey to increase our overall conversion rate. On top of this, Devitt are reviewing feedback items from customers via e-mail as well as following up queries via phone where relevant. Devitt chose Mopinion’s customer feedback analytics software to help identify the main pain points and barriers in the customer journey. The software enables us to investigate why customers are not purchasing our insurance and also gives our customers the opportunity to request a call back if they are experiencing problems. Devitt now collects customer feedback on a daily basis with an easy-to-use customer portal and the ability to set up ‘actions’ reducing the need for manual processes. Devitt uses primarily the exit feedback forms on its website. These forms are geared towards capturing visitors that leave midway through the ordering process. For example, when a customer looks like they’re about to leave the page (based on mouse behavior), an exit feedback form is triggered asking, “What’s the one thing that stopped you from buying from us today?” In which case, their visitors can fill in an open text response explaining why they haven’t gone through with the purchase. Mopinion has provided valuable feedback for Devitt from real customers. This has led to a number of improvements to the customer journey and has been used to feed into Devitt’s wider Conversion Rate Optimisation (CRO) project. Devitt is now able to identify and solve a number of customer pain points, allowing them to reconnect with and convert customers that would have otherwise dropped out of the journey and potentially gone elsewhere. Mopinion offers a flexible, user-friendly and cost-effective solution with a dedicated Account Manager. Devitt is now exploring ways to use Mopinion’s software itself to encourage and help visitors complete the customer journey.